Crowded meeting at Howes House Wednesday included historian David McCullough and his wife Rosalee (center from left). Despite fierce opposition from the Island community, Martha’s Vineyard Film Festival leaders said this week they intend to follow through with plans to buy a tract of residential farmland in West Tisbury where they hope to build a permanent home. In an email that went out to members last Thursday, the festival said it planned to buy 12.5 acres and a house at 694 Old County Road, property formerly belonging to the late Cynthia Walsh. A purchase and sale agreement has been signed to buy the property for $1.4 million. A closing is set for June 22, reportedly with no contingencies. No plan has been presented yet for the property. And any plan to develop it would need to clear a gauntlet of required regulatory approvals, including from the Martha’s Vineyard Commission and an array of local boards. 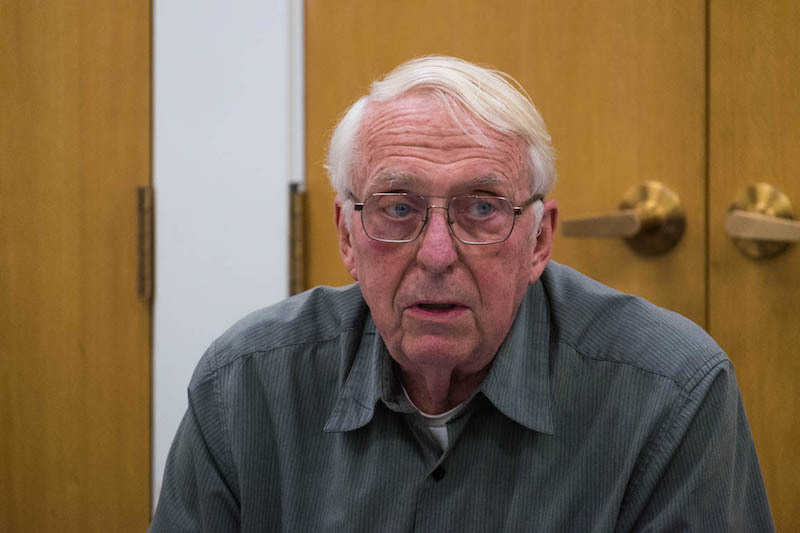 In late March, Mr. Bena attended a meeting of the West Tisbury planning board where he described a concept that includes a 6,000-square foot barn for film events, along with a commercial kitchen and a farming operation. Mr. Bena said festival leaders are working to raise $2 million for the project, and that an eight-member board of directors voted unanimously on May 3 to buy the property. Steve Bernier, a well-known Island businessman and Chilmark resident, is chairman of the MVFF board. Meanwhile, outrage simmered in the community and online this week, finally spilling out at a meeting of the town selectmen on Wednesday after a story on the Gazette website had attracted a flood of comments from readers. Following about an hour of discussion, board chairman Richard Knabel publicly called on the festival directors to reconsider their plans. 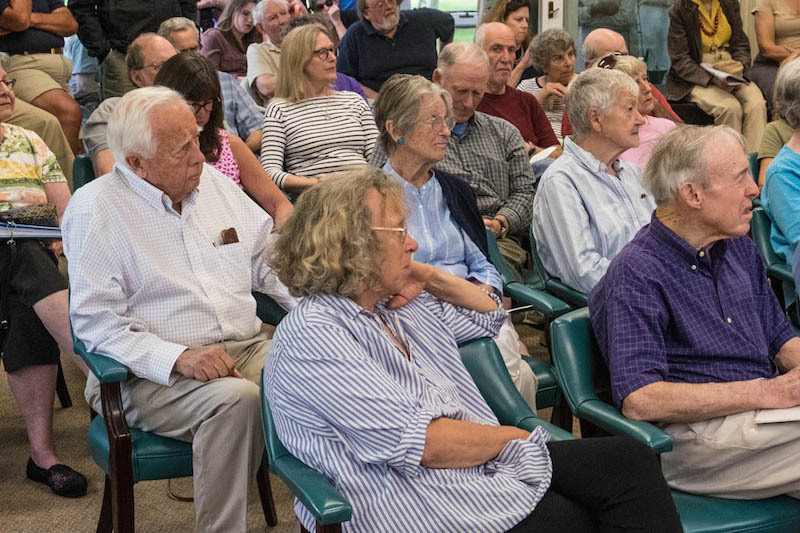 More than 50 people attended the selectmen’s meeting Wednesday, held at the Howes House, including the historian David McCullough and his wife Rosalee McCullough, longtime West Tisbury residents. Those who spoke out against the proposal included at least two people from other Island towns. Mark Reisman of Old County Road criticized the approach. “The festival’s quick purchase of the property without any public notice and a contract that apparently has no contingency clause suggests an approach designed to intimidate residents and local governmental agencies,” he said. “We seem to have a conflict here on the face of it,” Mr. Williams said of the proposal. Chilmark Library director Ebba Hierta, who lives in West Tisbury, also criticized the festival for claiming to have a mostly educational purpose. “This is a minuscule fraction of their overall activities,” she said. “What they are proposing here is an entertainment-restaurant complex. What else is a facility with a commercial kitchen that intends to sell food to the public?” She called on the selectmen to take a lead in rejecting the proposal. Tony McClellan, who lives across from the Walsh house, took exception to being called part of a lynch mob. “We are residents . . . in the neighborhood who live there because we like the community,” he said. “And we see it being abused.” His comments drew applause. Despite the outrage and frustration, the meeting never fell out of order and the mood was mostly upbeat. Several people spoke of their fondness for the neighborhood. 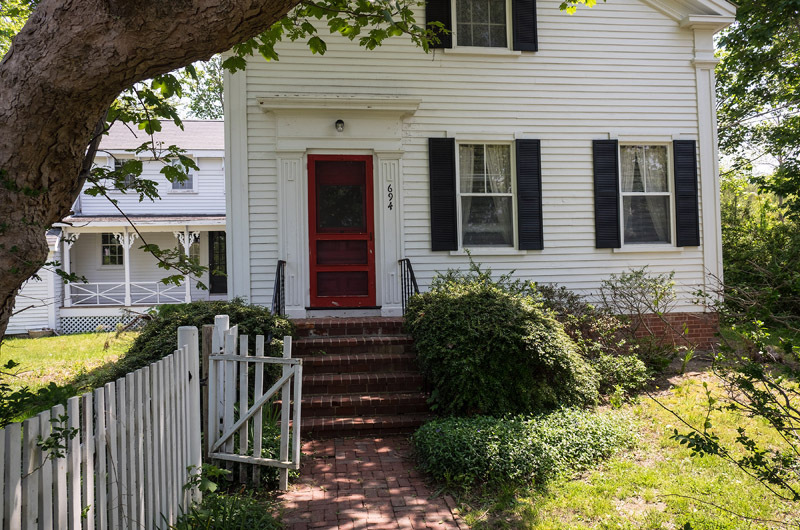 Cynthia Riggs, a novelist whose family has owned the Cleaveland House on Edgartown West Tisbury Road for generations, said she had originally opposed efforts to form a historic district, since residents already maintained their historic properties, but she later came around. Nancy Dole, a member of the historic district commission, said the commission’s power to condition a project at the Walsh property would be limited to the first 800 feet from the road. (The property is about 2,218 feet long and 295 feet wide at the road.) “The historic district commission is not going to be able to stop a 6,000-square-foot building in there — appropriate or not,” Ms. Dole said. In asking the film festival to withdraw its plans, Mr. Knabel said he was speaking only for himself but he acknowledged a demand for clear leadership from town citizens. “I call on Tom Bena, Steve Bernier and the film festival board, for the good of all concerned, to reconsider their proposal, and spare us all the needless and prolonged unpleasantness and expense it will more than likely cause if they choose to go forward,” Mr. Knabel said. While they did not attend the meeting, festival leaders said later they saw the process more as an opportunity than a trial. “We have a mission here to gather people and to spark discussion, debate and action,” Mr. Bena said. “And that’s how we want to go through this process.” He also anticipated a series of public forums this year, but only after the festival takes ownership of the land. “There’s no question in our mind that this is the place,” he said. This sounds like a good old fashioned Martha's Vineyard witch hunt. Unlike most of the people commenting across the board I actually grew up in West Tisbury and met Thomas Bena shortly after he arrived. Always been a good solid person. And now he wants to make a low key film fest venue in the "heart" of WT. Great! There is nothing for kids to do in that town, but head down island. Give the youth something back in a safe intelectual environment where they can get some perspective on the world. Screw your zoning, your hate and your quaint white clapboard properties. Mr. Bena claims this will be low key. Is he really spending millions to downsize his operation? Last year they had 65 events during the summer in addition to the film festival in March. I really don't think they want to get smaller. They want a movie theatre and a restaurant. The only supporter last night referenced a MVFF movie he saw at the high school this winter with 700 other islanders. It was a good film, but that is not "low key." And if this really is true - downsizing - then what is being described sounds just like the WT library. Why build a new building? And you really want to "screw zoning." Ok, let's do it - I would love a Target around here - it would really save me some money. 65 Events during the summer? That is an exaggeration. WT local, This is far from a "low key" operation. As a matter of FACT, it currently hosts 65 events, most of which are NOT low key. They show movies that bring 200-400 people. The March festival brings over 1000 people. They hope for weekly circuses, a commercial kitchen (that in WT would no doubt serve beer and wine), a daily summer camp and occasional film making or cooking class of some sort. This is not hate, this is a matter of the right to protect your town and your home from development. We treasure the character of the Island and the white clapboard houses of WT and the charm and character that each Island town. Each town unique and each protected by its own set of zoning bylaws that keep MV from turning into any over developed town anywhere else in America. You obviously left the Island, that was your choice. I chose to live in West Tisbury away from the busy commercial areas of festivals, circuses, restaurants and movie theaters. This is the beauty of having various zoned areas, they support and protect residential, commercial, industrial and agricultural areas we all use and love. Its not hate, its love for a town, love for the land we cherish and love for our friends and neighbors who want to leave their windows open at night and not draw the curtains because noise and headlights will wake their children. There are home being sold in West Tisbury for 40 million. The character of the island is in jepordy because of the cost of living, multi million dollar second homes and property owner entitlement. Unlike most I've donated land to conservation on the Island. There's more to a community then private beaches, private property and the Ag Fair. If I were you I would protest residential development, but in that case most Islanders would be out of business. From afar I see nothing but a retirement community in the making, just look at the cover photo..
@WT Local -- I see wise elders, not a retirement community. Lots of young families in WT. Quite the opposite, if someone’s actions and proposal draw the amount of criticism that Mr. Bena has received, a good solid person would take a look in the mirror and realize that, contrary to what he may have thought, this particular idea WILL NOT bring community together. And here are Mr. Bena’s own words as far as zoning and the preservation of his own neighborhood is concerned: “For hundreds of years people have built summer homes that are sensitive to the community and respect the rural character of our island…let’s be stewards not hogs”…”The movement to update zoning laws is not about style. It’s about size, stewardship and preserving the character of our community.”…”Stewardship is defined as the responsible overseeing and protection of something considered worth caring for and preserving”. The residents of West Tisbury care about the character of their neighborhood too, just like Mr. Bena. Do not destroy it. Opposition to the development is widespread among washashores and those whose families have lived here for generations. For example, at the meeting yesterday, Cynthia Riggs, who has deep multi-generational roots on the island, spoke eloquently on the subject. She also described how her late friend Cynthia Walsh, who owned and lived on the property and also had multi-generational roots on the island, would never have approved of the project on her land, land that she valued and enjoyed mostly in its natural state. To answer your question directly, the Walsh property bordering Old County Road, along with the properties around it on Old County Road, is part of the West Tisbury Historic District. The zoning and planning regulations that the residents have to observe in this area are significant and specifically are designed to preserve the historic and natural state of this part of the island. You might know about zoning and land use limitation and the desirability of preserve bucolic parts of island, since you apparently live on Lambert's Cove Road. The festival appears to want to take advantage of a zoning loophole to ram a project through what would otherwise not be permitted under local land use restrictions. By contrast, the MV Film Society, a non-profit organization that overlaps in function, observed all zoning and use requirements when it located in Vineyard Haven. Finally, I am sorry that driving to Edgartown is inconvenient for your movie-viewing in winter, but you can watch movies in other parts of the island, including at times in more appropriate locations in West Tisbury. There's also netflix in a pinch. Just my two cents! I'm sorry but you are exaggerating the impact. Morning to night...please. The personal attacks on the people here, people who did grow up on the island (except for Thomas) is unfair and really uncalled for. You should be ashamed of your behavior, really ashamed. The MVFF is not a bad thing, but they should not be exploiting loopholes in the law to put a restaurant/theatre in a residential neighborhood. Wouldn't you feel slightly offended if a public zoo just bought land and tried to open up next door to you claiming they can because they are educational? MVFF say they want to work with the community, so they should go through the proper process and not try to pull a "you can't stop us because we are educational" move. And really, education is only a fraction of what this organization currently does. Their primary goal is entertainment. On their website, it explains the organization started in response to a lack of good movies on the island (* I pasted it below). It wasn't in response to a need for education. I have confidence that our town officials will protects us from this type of precedent being set. Remember, the work of the MVFF is not on trial here. It's the fact that a moderately educational commercial enterprise is trying to move into a quiet neighborhood. They should look for an appropriately zoned piece of land. *In the middle of winter 2001, Thomas Bena and a group of friends were desperate for good movies. They had rented nearly every VHS tape and DVD at the local video store, and the two Island movie theaters were only showing mediocre blockbusters. Although Thomas had never even been to a film festival, he asked his friends to help him create an alternative movie experience—one that would feature fantastic films, exotic food, art, and music. The MVFF was born. I really have to take exception to your post. They are much more than movies and you haven't given them a fair hearing. You are basically accusing these people of being dishonest and that is so far from the truth. They are very decent people and the way you are portraying them is frankly disgusting and you should be ashamed of yourself. This is all about one simple thing: zoning. The MV Film Festival wants to relocate from a COMMERCIALLY zoned area in Chilmark to an historic, RESIDENTIAL zoned area in West Tisbury. They have tried to do this 2 times previously in West Tisbury and been denied both times by town boards. To the best of my knowledge, there is no actual commercial zoning in Chilmark. The CCC is certainly not a commercial location. Interesting that the only person in favor of the proposal last night was the gentleman from Chilmark. @Philip Tucker: "Uproar over small things . . . I notice that most of it is usually caused by washashores " A really odd contention. Why is it made? And I doubt that it is true. Except that very many who characterize themselves as "natives" in opposition to "washahsores" are first-generation, children of the influx of washashores that took place starting in the 1970s. These later "natives" now of course outnumber the "original natives." Not to speak of the Native Americans. You see how silly things can get when you make this kind of blunt argument and ridiculous distinction. A survey could be done, and perhaps SHOULD be done (now that the subject has been raised), (1) to establish whether it is true that only "washashores" disapprove of the film center expansion project, and (2) to provide a database that could be used to explore how such ad hominem characterizations are deployed to damp down criticism by focusing on "identities" rather than the merits of arguments. It is pathetic to bring in this line of argument. Similar to the spurious argument on the earlier thread that tries to impute snobbery to up-lslanders re down-islanders/Oak Bluffs and introduces nonexistent antagonisms in order to fuel those antagonisms. For shame. Stick to the arguments and drop the ad hominem message that "real" islanders are tolerant of change and the supposed washashores are NIMBYs. Twenty years ago was then. The "there is nothing for youth to do" argument belongs maybe in the fifties, not in the 2000-teens. The young people I know have very full schedules, and I very much doubt that that village of WT has enough young people to populate this center. More moms driving kids to more activities. Actually, fewer structured activities would probably be a very good thing for youths, who gain a lot by wandering around the countryside and figuring out ways to entertain themselves. If there is any countryside left to wander around in. That was the plus of growing up in WT when "there was nothing to do." Mr. Tucker: "Now everyone is more concerned with the "bucolic' feel." D--- straight they are. That is exactly what they love, and no scare quos needed around the word bucolic. When I am driving or biking up-island I love to come to the expanse of Nat's field (which used to be a thick carpet of daisies in June, but now, for some reason, no longer), then proceed into the village with older houses and fields on either side. Most of it very like my youthful memories. I was upset to see that one of my favorite, most "artistic-looking" trees had been chopped down, but at least I have a series of photos of it . . . I love to go down Scotchman's Lane, in my car or on my bike, and enjoy the fact that this is dale of paradise is still there to be enjoyed. I love the approach to the village along Music Street, still "untouched." So, yes, we do notice the beauty around us, thank you very much. I, too, met Thomas Bena years ago and found him to be a nice, simpatico young man. Over the years I have also heard on the grapevine complaints of Mr. Bena's high-handed ways in a variety of contexts. Whatever the motivations behind the MVFF's plans, the project itself deserves the storm of rejection that it has evoked. I strongly advise all board members to stand before the public and justify both the project and the process so far, and describe the internal process whereby the decision was made to take this route. I have a good idea as to who is the head man for the "food service/growing" aspect of this plan. I have written the name in a spiral notebook and made a bet with myself. If I am right, I treat myself to a nice eat-out. Mr. Tucker does seem to have his facts mixed up. The building that concerns most all of us is said to be 6000 square feet No plan has been presented I am going by what I read. We are not looking at just a movie theater none that I know of have a commercial kitchen! In regard to historic well lets see: it once was the main road for traffic (Sate Road had not been established)with a courthouse and jail at the head of the street (hence the name) Wm Rotch house (now Nessen's) is well over 100 years Sara Burt's (Bruno's) across the road one of the older houses in the village. The Campbell (Walsh house) was built and occupied by the family Cleveland. The house now owned by the Brandon family dates way back in time. Other than the Foster house and Maria Hancock's (now owned by Ellen Weiss)there were no other houses on the road for many years. I could go on but the point I am attempting to make is that it is and always has been a residential area. This idea is totally inconsistent with the area and another move to destroy what Willie Huntington and Joe Allen once described as the lovelyist village of the Plain. Natives are capable to adapt to change but this project is is far from necessary. John Alley is exactly right. A 6,000 square foot building is a very large building indeed, in any Island town. In West Tisbury, it's completely inappropriate. And true - movie theaters don't have commercial kitchens! I don't know what these people plan, but given the approach they've taken on this - which seems to completely spurn their neighbors and the community - they know darn well that their project will NOT be popular. This is the very reason for the existence of zoning - it is the purpose of zoning laws - to prevent this very thing. And hey Chris Murphy - what is up with calling people a lynch mob because they disagree with a proposed project that is so clearly inappropriate to the site? I hate to burst your libertarian bubble, but none of your rights - or mine - are unrestrained. It's called living in a society. Have a little more respect and courtesy for your neighbors, maybe. As a non-profit organization, why is TMVFF risking the community goodwill that they've built up over the years and potentially spending tremendous amounts of donor money on what looks likely to be a protracted and divisive ensuing public battle, all over this specific location? Thomas Bena and TMVFF Board: You're so desperate for a barn theatre that you're acting like your vision supersedes the will of the WT community. You are well aware because you've been blocked twice from buying land here. Do you know what's best for everybody? You are now fighting local government and residents. Think about that. 6000 sq. ft. used by many compared to millions of square feet built by islander tradesmen used by a few second home owners. The math is simple your fighting the wrong battle. -Multi Generational Islander Who's Family Shipwrecked off the South Side of West Tisbury - literally a "Wash Ashore"
@"he math is simple your fighting the wrong battle. Weird. First, there is more than one "battle" to be fought when it comes to heading off inappropriate development Second: The zoning battle has been fought in WT. It is MVFF that seems to be choosing this battle to overturn the results of a previously fought battle. There are many ways to try to channel development of the Vineayrd. One of them is to preserve what is left via conservation purchases, restrictions, etc. and zoning that limits the size of buildings (also homes) in relation to lot size. I think chilmark has tried to do this or is doing it. Could that be another reason why MVFF is moving to WT? I am not an expert on towns' zoning laws, but . . . ? I think there's a genuine opportunity for some big picture thinking here. If we look at the issue of an educational facility, Penekese Island did some amazing work offering a last-chance location for troubled teens from all over New England. These were kids on their last strike before entering the criminal justice system. We could combine a similar facility with the film center/farm-to-table concept currently under consideration. Yes, there were some violent offenders in the mix at Penekese, but mostly it was good kids who just had been dealt a bad hand in life. The kids could work the farm during the day and then make films on the state-of-the-art equipment at night to tell their life stories. It could be a residential school/film center that would combine art, agriculture, education and rehabilitation. I have no doubt the good people of West Tisbury, when given the opportunity to provide this kind of opportunity to the youth of New England, would embrace the idea with open arms in a way the current proposal hasn't seen yet. Big picture thinking is what's in order here. We are struggling with a heroin epidemic. An arts center can play a positive role. But whatever we do let's keep the conversation civil. Good things can come from this whether WT turns out to be right location or not. Yes, Michael. Absent from the conversation so far is recognition of Thomas Bena's huge success with MVFF. The Film Festival understandably wants to take the next step, but the delicate habitat of gentle West Tisbury would be an unfortunate recipient of this heavy a footprint. @"The kids could work the farm during the day and then make films on the state-of-the-art equipment at night to tell their life stories." Maybe MVFF could to this kind of project ON Penikese. I can see the flack. why not just put a drive in on the property. That would be the same thing. They are taking advantage of being a nonprofit. I think a few other organizations have done that. The civility that Michael Ditchfield rightly demands would likely be far more in evidence if people did not hide behind pseudonyms. Identify yourselves and state your position. The Anonymity helps no one and diminishes the impact of your perspective along with often degrading the conversation to insults and attitude. Perhaps the MVFF will send a representative to the next public forum. Bravo, Mr Berlin ! Are they going to allege having their own septic system only to hook into the town system at the end of the dance ? Seems fashionable these days. Commercial kitchen is quite a red flag. This type of facility belongs down Island. No one with any sense of the way life is in West Tisbury would ever suggest such a thing. The Hot Tin Roof site is clearly waiting for the MVFF to see what has been there all along. Perfect access for the entire island community. A kitchen already plumbed. Restrooms. Parking. A solid supply of intoxicating beverages right next door. And most importantly -- the proper zoning! It feels as though the energy MVFF is putting into buying a residential/agricultural site is fueled more by unresolved grudges, than finding the right location to maintain and expand their specific program. (I had no idea the film festival even grew food . . . ). I hope they will re-direct their energy, set a good example of true creative vision and community stewardship: renovate, re-use and re-vitalize. The HTR,aka Flatbread,was recently up for sale at roughly the same asking price as the piece of land in W Tis currently in question. But I doubt that TMVFF would have even considered that locale for various reasons. Steve, do you know who bought it? That would certainly be a far more appropriate property for this proposal. The former Hot Tin Roof site should always remain a music venue. not a movie theatre! The problem is that West Tisbury people think that the world owes them a permenent version of their toen. Real estate values are high and they don't want the huddled masses to have a film festival in their midst. Some issues could be worked out with the town, dates, times, parking ..... You just don't want to budge. You can't force other landowners to share your dream. Dialog, not hysteria. I've known Thomas Bena for a while and he's a solid guy of good character. We can debate the merits of a plan or concept without ad hominem attacks. The issue is zoning, not Mr. Bena personally. 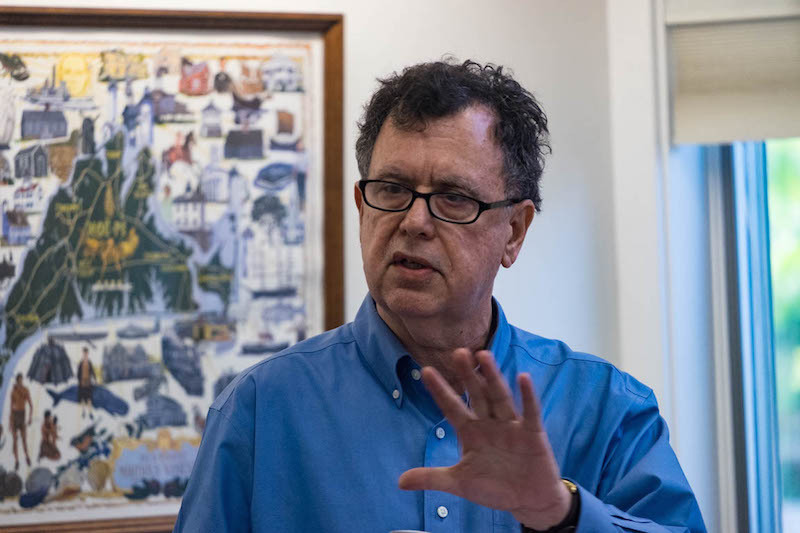 When people accuse West Tisbury residents of hysteria or being a lynch mob or accuse them of making personal attacks, they seek to divert the discussion away from the substance. The festival seeks to use a clever legal strategy to undertake a development on property in a protected district that is in violation of zoning regulations that would otherwise apply. The festival is using this approach because, in the absence of that strategy, they failed in two previous attempts to transfer to West Tisbury. They could use the same legal strategy in Chilmark, where they are now located in a commercially zoned area. But their sponsors live primarily in Chilmark and would obviously prefer that West Tisbury host the festival in the middle of its historic district and absorb the consequences. It's not really that complicated. And people throughout the island who view this as a West Tisbury problem should understand that if the legal strategy is successfully used there, it will be available for use and will be employed throughout the island to override local zoning protections that have been voted for and are relied upon by residents in those locations. Long live the festival, which seems to be doing well in its existing commercial and public locations! 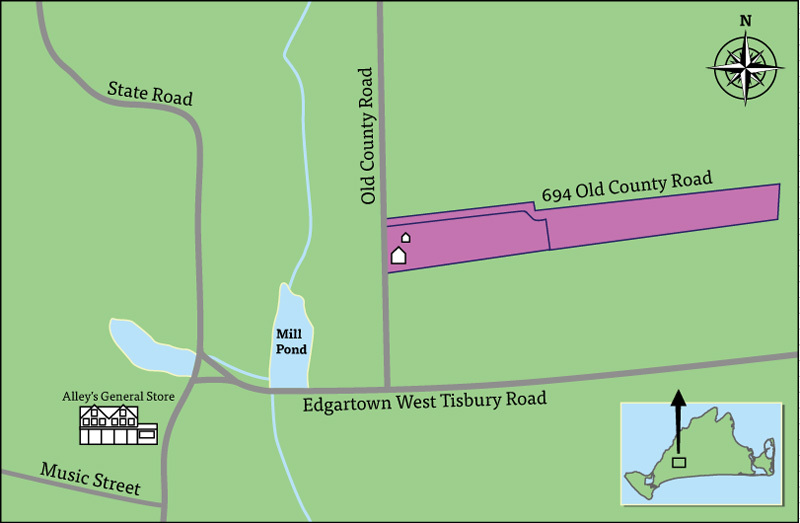 And if it finds an appropriately zoned location, most West Tisbury residents would no doubt support its expansion plans on a new campus. Thank you Mark, this is a perfect example of focusing on facts, not personalities. Some of the other postings have been a little bit overboard. Personally I have no opinion on the matter and feel it's best left to West Tisbury residents, and it is pretty clear by now which direction the winds of sentiment are blowing. No one cares who got to West Tisbury first. Once you start down that road you must realize that you are all washashores, the Native Americans were here first. So let's stick to the facts. The purchaser believes that he has a righ to build this film venue. He will work with the town. The Amen chorus in West Tisbury does not like it. The town will follow the law. I have been a fan of the MVFF since its inception in 2001. So much so that when I am planning to be off-Island in March, I make sure I will be back by the winter showing of so many terrific films. That said, when I first heard of the plan to buy the Walsh property, I thought there must be some mistake. It wasn't possible that they were foolish enough to want to put their huge operation (a long way from the first showings at the Grange - and that's all to the good) on an exquisite open meadow, off a part of Old County Road where traffic is already relatively heavy (for West Tisbury), especially in summer. And so, yes, I'm opposed for pretty much all the reasons stated already. What disturbs me most, however, is Tom Bena's remark, as quoted by Richard Andre: "I don't want to be like the...Film Society and build a movie theater in a strip mall". That is a nasty, condescending statement about Richard Paradise's successful and marvelous Film Society which has given this Island community so much pleasure and, yes, enrichment - especially all winter long. Sadly, perhaps in those words there is the truth of what the MVFF is all about: Good films and discussion which can only succeed if packaged in some snobbish notion of Up-Island Panache - it's all just a frolic in a daisy field. That quote about a strip mall sums up a lot. If the county road location does not work out for MVFF, maybe the Charter School could use a 6000 square foot multi use facility.